Manteo is a town in Dare County, North Carolina, United States, located on Roanoke Island. On the 20th (Sat), take a peaceful walk through Nags Head Woods Ecological Preserve, contemplate the long history of Wright Brothers National Memorial, and then explore the striking landscape at Jockey's Ridge State Park. On the 21st (Sun), you'll have a packed day of sightseeing: admire nature's wide array of creatures at North Carolina Aquarium on Roanoke Island, then visit a coastal fixture at Bodie Island Lighthouse, then take in the waterfront at Jennette's Pier, and finally get your game on at Life on a Sandbar. To see where to stay, more things to do, reviews, and tourist information, go to the Manteo online trip itinerary planner . Salt Lake City to Manteo is an approximately 9.5-hour combination of flight and car. You can also do a combination of flight, bus, and car; or drive. Due to the time zone difference, you'll lose 2 hours traveling from Salt Lake City to Manteo. Plan for somewhat warmer nights when traveling from Salt Lake City in April since evenings lows in Manteo dip to 51°F. Finish up your sightseeing early on the 21st (Sun) so you can go by car to Hatteras Island. 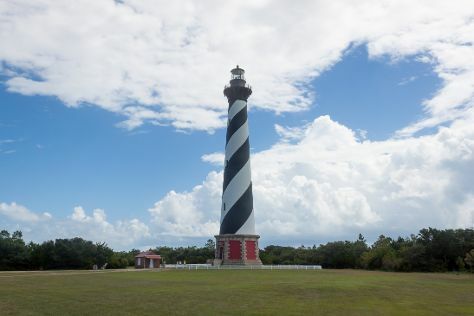 Start off your visit on the 22nd (Mon): explore the striking landscape of Cape Hatteras National Seashore. Keep things going the next day: steep yourself in history at Cape Hatteras Lighthouse, look for gifts at Scotch Bonnet, then stroll through Frisco Beach, and finally hunt for treasures at Buxton Seafood. To find ratings, maps, and other tourist information, refer to the Hatteras Island trip tool . Traveling by car from Manteo to Hatteras Island takes 1.5 hours. In April, daytime highs in Hatteras Island are 68°F, while nighttime lows are 54°F. Finish your sightseeing early on the 23rd (Tue) so you can travel to Rodanthe. Rodanthe is an unincorporated community and census-designated place (CDP) located in Dare County, North Carolina, United States, on Hatteras Island, part of North Carolina's Outer Banks. Start off your visit on the 24th (Wed): make a trip to Chicamacomico Life-Saving Station Historic Site & Museum, enjoy the sand and surf at Pea Island National Wildlife Refuge, and then don't miss a visit to Rodanthe Pier. To see reviews, maps, and other tourist information, go to the Rodanthe tour itinerary builder app . You can drive from Hatteras Island to Rodanthe in an hour. Traveling from Hatteras Island in April, expect a bit cooler with lows of 48°F in Rodanthe. Cap off your sightseeing on the 24th (Wed) early enough to travel to Corolla. On the 25th (Thu), enjoy the sand and surf at Carova Beach and then get a dose of the wild on a nature and wildlife tour. Get ready for a full day of sightseeing on the 26th (Fri): kick back and relax at Currituck Beach and then visit a coastal fixture at Currituck Beach Lighthouse and Museum. To find traveler tips, other places to visit, where to stay, and tourist information, you can read our Corolla online tour itinerary planner . Traveling by car from Rodanthe to Corolla takes 1.5 hours. In April, daytime highs in Corolla are 70°F, while nighttime lows are 51°F. Finish up your sightseeing early on the 26th (Fri) so you can travel back home.